I have played quite a few missions on cmbn, particularly in campaigns, where the AI mortars and artillery are so accurate. They hit my men perfectly every time, even if my men are far back and cant be spotted. It also seems that if i dont move the men they get hit by artillery as well. For example, on the first mission of scottish corridors, i advanced forward and spotted the enemy lines. then i stopped moving and haulted my men until my artillery came in. But one of my platoons which was pretty much the least visible got hit perfectly by enemy mortars for about only 20 seconds, only a few turns after one of my other platoons was hit. Although i am sure it is, it doesnt feel like mortars, it is almost as if 4 pak at guns fire at each platoon for about 20 seconds with no delay and perfect accuracy. This was similar on courage and fortitude on the second mission. Is this normal? How does the ai artillery work? is it preplanned to go off at a set point at a set time or does it cheat? Pre-planned fires depend on scenario and even among experienced scenario designers they can be hugely, insanely, stupidly hit-and-miss. As in if you follow the imagined "script" the designer has in mind, you'll find out your overwatch position explodes underneath you. But if you deviate, even by a few minutes, the artillery doesn't do a damned thing and the AI isn't capable of overriding or adjusting the pre-planning (AFAIK). The other stuff is just giving the AI a high quality (vet or higher) FO, followed by high quality mortars and spotting your unit in a certain position. It seems to me (and I'm not really willing to do testing to prove or disprove otherwise) the AI only needs to see a glimpse of a unit to call down the mission and once it does, the mission will hit that visible spot, the last one where it saw your unit as long as the FO isn't suppressed or kill in the meantime. They aren't cheating or anything but high quality FOs placed in locations where they can observe unmolested see a lot more than you might expect they would. They also seem to prioritize stationary units, on the logic that those are your base of fire elements and a better use of scarce shells than chasing after a unit that runs about the map to avoid being malleted. As for mortar rate of fire, you can go on Youtube and find any number of videos where real soldiers hang and drop rapidly for real mortar fire missions. Admittedly easier to find modern footage, but there hasn't exactly been a revolution in mortar tubes since WW2. They really do come down hard and fast like that, with the caveat that in-game it is quite a bit more accurate than is typical in real life, even for modern GPS-assisted shoots. The number one reason is that there is stuff like the first few rounds in a fresh position "setting" the baseplate steady, the individual variation between rounds, tubes heating up and raising dispersion, slight shifts and the fact that when you're just hanging and dropping like mad the gunner isn't taking time to adjust aim so its perfectly aligned. But that is sorta academic, since 81s at least will coverage their dispersion in shrapnel anyway. @TheForwardObserver can probably talk more (and better) about it. Hello...And welcome to the forum ! IIRC pre-planned artillery is limited to bombardments STARTING on turn one. The duration of the bombardment might be considrably longer (lasting several turns ) but it will always start towards the middle/end of the first turn. This restriction to pre-planned bombardments is true to both the AI as well as the players side. As the player you will be able to designate any part of the map, regardless of LOS, that you would like to hit with artillery/mortars (starting on turn one). The scenario designer can asign simular pre-planned target locations to the AI using the artillery interface in the editor. The limitation being...the bombardment will always start on turn one ! If you are being hit by AI artillery at a later time in the scenario it is not a pre-planned AI bombardment designated by the scenario designer. What a scenaro designer can do however is place a number of TRPs on parts of the map that he belives that the player will move his forces through. 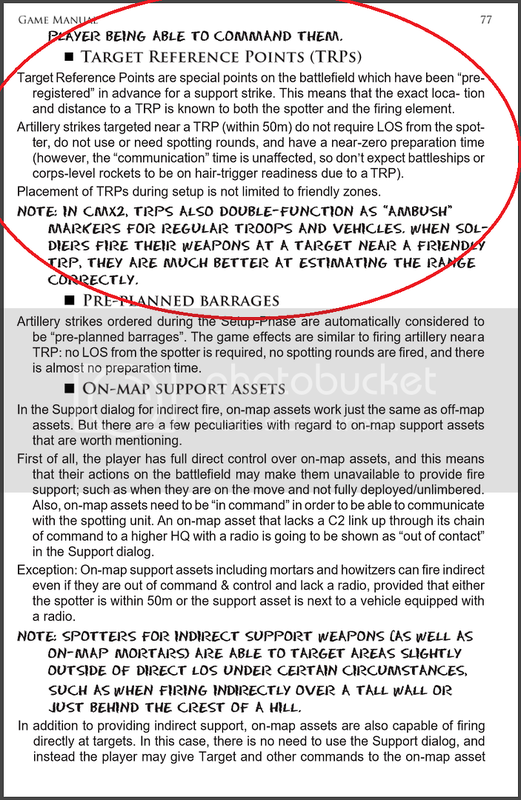 These TRPs (Target Refrence Point) will help the AI call in artillery faster on- or close to these points. This might be part of what you are seing...the designer might have placed TRPs at those locations that you have moved your troops into...allowing the AI to much faster call in the artillery on those areas. To do this the AI will however need to spot your untis (i think). But using TRPs are not 'cheating' by the part of the AI. As mentioned in the manual it is simulating pre registred target location that have already been measured in before the battle started. In many scenarios you as the player will also be given TRP-markers that you will be able to place anywhere on the map to allow for rappid bombardments. Another reason for quick AI artillery bombardments might be on-map mortars. If the AI force have mortars on the map that have LOS to your units, or close by, it will be able to almost instantly start to fire at that location usually with great accuracy. The scenario designer can help the AI to target specific locations on the map (pre-planned artillery)...But those are limited to turn one. The scenario designer can help the AI to get quicker repons times by placing TRPs on the map. Other then that the AI are left to its own when it comes to how it uses its artillery/ mortars limited to pretty much the same restrictions as the player have...i do however belive that the AI have one sort of a free-card...It is not required to maintain C2 connections between its units...The AIs 'spotting unit' and 'shooting units' will never be out of contact with other friendly units...Making calling for artillery somewhat easier. ty a lot for the replies, that has helped a lot. The ai must have just got some good and/or lucky artillery then and that is fine by me. In many strategy games, i have later found that the ai cheat but i am glad to hear that this is not the case in cmbn so i will stop complaining about the outcomes.